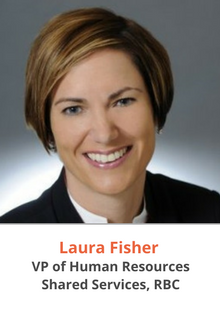 Laura Fisher, Vice President, Human Resources Shared Services, is responsible for the leadership and strategic direction Human Resource Shared Services globally. HR Shared Services provides essential employee services to RBC employees, retirees and contingent labour. The team consists of 400 HR Shared Service professionals who are located in North America, the British Isles, Luxembourg, the Caribbean, Hong Kong and Singapore. This team is responsible for the delivery and advice of critical employee services from recruitment offer letter/pre-employment screening to payroll, pension, benefits, relocations and employee donations. Laura considers herself to be a “professional generalist”. She enjoys taking on new challenges, learning about different parts of the organization, pushing her comfort zone, and challenging the status quo. She has held roles and led teams across multiple domestic and international geographies and Laura has served clients across multiple channels including face-to-face, social media, Advice Centres and through third party vendors and channels. She has experience working in the retail branch banking network, regional offices, sales, operations, Advice Centres, insurance, credit adjudication and National Office.